Bhaktamara Stotra is a famous Jain Sanskrit prayer. It was composed by Acharya Manatunga (seventh century CE). The name Bhaktamara comes from a combination of two Sanskrit names, "Bhakta" (Devotee) and "Amar" (Immortal). The prayer praises Rishabhanatha (adinath), the first Tirthankara of Jainism in this time cycle. There are forty-eight verses in total. The last verse gives the name of the author Manatunga. Bhaktamar verses have been recited as a stotra (prayer), and sung as a stavan (hymn), somewhat interchangeably. Other Jain prayers have taken after these (such as the Kalyānamandira stotra, devoted to the twenty-third tirthankara, and the Svayambhu stotra, to all twenty-four); additional verses here praise the omniscience of Adinatha, while devotionals are considered a source for lay understandings of Jain doctrine. Bhaktamar stotra word by word meaning in hindi. According to legends, Manatunga Āchārya was chained and imprisoned by the local King Bhoja. Mantunga Āchārya composed this stotra (hymn) in the prison. With the completion of each verse, a chain broke, or a door opened. Manatunga was free when all the verses were finished. Legends associate Manatunga with a ruler named Bhoja. However Manatunga probably lived a few centuries before Raja Bhoja of Dhara. He is identified by some scholars as Kshapanaka, one of the Navaratnas in the court of legendary Vikramaditya. An unidentified Sanskrit poet Matanga, composer of "Brahaddeshi" on music theory, may also have been the same person. Bhaktamara stotra was composed sometime in the Gupta or the post-Gupta period, making Manatunga approximately contemporary with other navaratnas like Kalidasa and Varahamihira. Several spots near Bhopal and Dhar are traditionally associated with Manatunga. Bhaktamara Stotra is believed to be at least a thousand years old, though many believe it to be still older. Bhaktamara Stotra has been passed down from generation to generation. It is an ageless panegyric. The importance and effectiveness is believed to have increased with the passage of time. Bhaktamara Stotra is recited by many with religious regularity. The original Stotra is in Sanskrit and written in Devnagiri script. The Bhaktamar Stotra has 48 stanzas. Every stanza has four parts. Every part has 14 letters. The complete panegyric is formed by 26 88 letters. It is said that some specific stanzas are miraculously effective for fulfilment of different purposes. Bhaktamar pranat maulimaniprabhanam uddyotakam dalita pap tamovitanam.Samyak pranamya jin pad yugam yugada- valambanam bhavajale patatam jananam. Having duly bowed down at the feet of Bhagwan Adinath, the first Tirthankar, the divine glow of his nails increases luster of jewels of their crowns. Mere touch of his feet frees the beings from sins. He who submits himself at these feet is saved from taking birth again and again. I offer my respectful salutations at the feet of Bhagavan Adinath, the propagator of religion at the beginning of this era. Yah samstutah sakala vaangmaya tatva bodhaat dudbhuta buddhi patubhih suraloka naathaih. Stotrair jagattri taya chitta harairudaaraih stoshye kilahamapi tam prathamam jinendram. The Lords of the Gods, with profound wisdom, have eulogized Bhagavan Adinath with Hymns bringing joy to the audience of three realms (heaven, earth and hell). I shall offer my obeisance in my endeavour to eulogize that first Tirthankar. Buddhya vinaapi vibudharchita padapitha stotum samudyata matirvigata trapoaham. Balam vihaya jala samsthitam indu bimbam anyah ka ichchhati janah sahasa grahitum. Shameless I am, O God, as a foolish child takes up an inconceivable task of grabbing the disc of the moon reflected in water, out of impertinence alone, I am trying to eulogize a great soul like you. Vaktum gunan gunasamudra shashankakantan kaste kshamah suraguru pratimoapi buddhya. Kalpanta kala pavanoddhata nakra hakram ko va taritum alam ambunidhim bhujabhyam. O Lord, you are the ocean of virtues. Can even Brihaspati, the teacher of gods, with the help of his infinite wisdom, narrate your virtues spotless as the moonbeams? (certainly not.) Is it possible for a man to swim across the ocean full of alligators, lashed by gales of deluge? (certainly not). Soaham tathapitava bhakti vashanmunisha kartum stavam vigatashaktirapi pravrittah.Prityatma viryam avicharya mrigi mrigendram nabhyeti kim nijashishoh paripalanartham. O Great God ! I am incapable of narrating your innumberable virtues. Still, urged by my devotion for you, I intend eulogise you. It is well known that to protect her fawn, even a deer puts his feet down and faces a lion, forgetting its own frailness. (Similarly, devotion is forcing me to eulogise you without assessing my own capacity). Alpashrutam shrutavatam parihasadham tvadbhakti-reva mukhari kurute balanmam. Yat kokilah kila madhau madhuram virauti tachchamra charu kalika nikaraika-hetuh. O Almighty! I am so unlettered that I am subject to ridicule by the wise. Yet, my devotion for you forces me to sing hymns in your praise, just as the cuckoo is compelled to produce its melodious coo when the mango trees blossom. Tvat sanstavena bhavasantati sannibaddhampapam kshanat kshayamupaiti sharirabhajam. Akranta lokamalinilamasheshamashu suryamshu bhinnamiva sharvara mandhakaram Just as the shining sun rays dispel the darkness spread across the universe, the sins accumulated by men through cycles of birth, are wiped out by the eulogies offered to you. Matveti nath ! tava samstavanam mayedamam arabhyate tanudhiyapi tava prabhavat. Cheto harishyati satam nalinidaleshu muktaphala dyutim upaiti nanudabinduh I begin this eulogy with the belief that, though composed by an ignorant like me, it will certainly please noble people due to your magnanimity. Indeed, dew drops on lotus-petals lustre like pearls presenting a pleasant sight. Astam tava stavanam astasamasta dosham tvat samkathapi jagatam duritanihanti Dure sahasrakiranah kurute prabhaiva padmakareshu jalajani vikasha bhanji. The mere utterance of the great Lord's name with devotion, destroys the sins of the living beings and purifies them just like the brilliant sun, which is millions of miles away; still, at the break of day, its soft glow makes the drooping lotus buds bloom. 10.नात्यद्-भुतं भुवन - भूषण ! भूत-नाथ! Natyadbhutam bhuvana bhushana ! bhutanatha bhutairgunairbhuvi bhavantam abhishtuvantah. Tulya bhavanti bhavato nanu tena kim va bhutyashritam ya iha natmasamam karoti O Lord of beings ! O Ornament of the universe! It is no wonder that he who is engaged in praising your infinite virtues (imbibing the virtues in his conduct) attains your exhilarated position.It should not be surprising if a benevolent master makes his subjects his equals. In fact, what is the purpose of serving a master who does not allow his subjects to prosper to an elevated position like his ? नान्यत्र - तोष- मुपयाति जनस्य चक्षु:। पीत्वा पय: शशिकर - द्युति - दुग्ध-सिन्धो:, क्षारं जलं जलनिधेरसितुं क इच्छेत्? Drishtava bhavantam animesha vilokaniyam nanyatra toshamupayati janasya chakshuh.Pitva payah shashikaradyuti dugdha sindhohksharam jalam jalnidhe rasitum ka ichchhet? O Great one ! Your divine grandeur is enchanting. Having once looked at your divine form, nothing else enthrals the eye. Obviously, who would like to drink the salty sea water after drinking fresh water of the divine milk-ocean, pure and comforting like the moonlight? Yaih shantaragaruchibhih paramanubhistavam nirmapitastribhuvanaika lalamabhuta Tavanta eva khalu teapyanavah prithivyam yatte samanam aparam na hi rupam asti. O Supreme Ornament of the three worlds! As many indeed were the atoms filled with lustre of non-attachment, became extinct after constituting your body, therefore I do not witness such out of the world magnificence other than yours. Vaktram kva te sura naroraga netra hari nihshesha nirjita jagat tritayopamanam. Bimbam kalanka malinam kva nishakarasya Yad vasare bhavati pandu palasha kalpam Comparison of your lustrous face with the moon does not appear befitting. How can your scintillating face, that pleases the eyes of gods, angels, humans and other beings alike, be compared with the spotted moon that is dull and pale, during the day, as the Palasa leaves. Indeed, your face has surpassed all the standards of comparison. Sampurna mandala shashanka kala kalapa shubhra gunastribhuvanam tava langhayanti Ye sanshritastrijagadishvara! nathamekam kastan nivarayati sancharato yatheshtam O Master of the three worlds! Your innumerable virtues are radiating throughout the universe-even beyond the three worlds, surpassing the glow of the full moon; the hymns in praise of your virtues can be heard everywhere throughout the universe. Indeed, who can contain the movement of devotees of the only supreme Godhead like you? Chitram kimatra yadi te tridashanganabhir nitam managapi mano na vikara margam. Kalpanta kala maruta chalitachalena kim mandaradri shikhiram chalitamkadachit Celestial nymphs have tried their best to allure you through lewd gestures, but it is not surprising that your serenity has not been disturbed. Of course, is the great Mandara mountain shaken by the tremendous gale of the doomsday, that moves common hillocks? Nnirdhumavartipavarjita taila purah kritsnam jagat trayamidam prakati karoshi. Gamyo na jatu marutam chalitachalanam dipoaparastvamasi natha ! 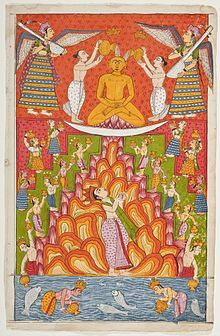 jagatprakashah You are O Master, an irradiating divine lamp that needs neither a wick nor oil,and is smokeless, yet enlightens three realms. Even the greatest of storm that does not effect it. Nastam kadachidupayasi na rahugamyah spashtikaroshi sahasa yugapajjaganti. Nnambhodharodara niruddha maha prabhavah suryatishayimahimasi munindra! loke O Great one ! Your glory is greater than that of the sun. The sun rises every day but sets as well. The sun suffers eclipse, is obstructed by the clouds, but you are no such sun. Your infinite virtues and passionlessness cannot be eclipsed. The sun slowly shines over different parts of the world, but the glory of your omniscience reaches every part of the world, all at once. Nityodayam dalitamoha mahandhakaram gamyam na rahuvadanasya na varidanam. Vibhrajate tava mukhabjamanalpakanti vidyotayajjagadapurvashashanka bimbam. O Master! Your beautiful face transcends the moon. The moon shines only at night but your face is always beaming. The moon light dispels darkness only to a some level, your face dispels the delusion of ignorance and desire. The moon is eclipsed as well as obscured by clouds, but there is nothing that can shadow your face. Kim sharvarishu shashinanhi vivasvata va yushman mukhendu daliteshu tamassu natha! Nishpanna shalivana shalini jivaloke karyam kiyajjaladharairjalabhara namraih. O God ! Your aura dispels the perpetual darkness. The sun beams during the day and the moon during the night, but your ever radiant face sweeps away the darkness of the universe. Once the crop is ripe what is the need of the cloud full of rain. Jyanam yatha tvayi vibhati kritavakasham naivam tatha Hari Haradishu nayakeshu. Tejah sfuran manishu yati yatha mahattvam naivam tu kachashakale kiranakuleapi. O Supreme God! The infinite and eternal knowledge that you have, is not possessed by any other deity in this world. Indeed,the splendour and shine of priceless jewels can not be seen in the glass pieces shining in the light. Manye varam Hari Haradaya eva drishta drishteshu yeshu hridayam tvayitoshameti. Kim vikshitena bhavata bhuviyena nanyah kashchinmano harati natha ! bhavantareapi. O Ultimate Lord ! It is good that I have seen other deities before seeing you.The dissatisfaction even after seeing them has been removed by the glance of your detached and serene expression. That I have seen the supreme I can not be satisfied with anything less. Strinam shatani shatasho janayanti putran nanya sutam tvadupamam janani prasuta. Sarva disho dadhati bhani sahasrarashmim prachyeva digjanayati sphuradamshujalam. O the great one! Infinite stars and planets can be seen in all directions but the sun rises only in the East. Similarly numerous women give birth to sons but a remarkable son like you was born only to one mother; you are very special. Tvamamanati munayah paramam pumamsham adityavaranam amalam tamasah purastat. Tvameva samyagupalabhya jayanti mrityum nanya shivah shivapadasya munindra ! panthah. O monk of monks ! All monks believe you to be the supreme being beyond the darkness, splendid as the sun. You are free from attachment and disinclination and beyond the gloom of ignorance. One obtains immortality by discerning, understanding,and following the path of purity you have shown. There is no path leading to salvation other than the one you have shown. Tvamavayam vibhumachintya masankhyamadyam Brahmanamishvaramanantamanangaketum. Yogishvaram viditayogamanekamekam jnanasvarupamanmalam pravadanti santah. O God ! After having seen you in different perspectives, monks hail you as: Indestructible and all composite, All pervading, Unfathomable, Infinite in virtues, Progenitor (of philosophy), Perpetually blissful,Majestic, having shed all the karmas, eternal, Serene with respect to sensuality, Omniscient in form, and free from all vices. Buddhastvameva vibudharchita buddhibodthat tvam Shankaroasi bhuvanatraya shankaratvat. Dhatasi dhira!shivamarga vidhervidhanat vyaktam tvameva Bhagavan!purushottamoasi. O Supreme God ! The wise have hailed your omniscience, so you are the Buddha. You are the ultimate patron of all the beings, so you are Shankar. You are the developer of the codes of conduct( faith,Right knowledge and Right conduct)leading to Nirvana, so you are Brahma. You are manifest in thoughts of all the devotees, so you are Vishnu. Hence you are the Supreme God. Tubhyam namastribhuvanartiharaya natha Tubhyam namah kshititalamala bhushanaya. Tubhyam namastrijagatah parameshvaraya Tubhyam namo jina! bhavodadhi shoshanaya. O Salvager from all the miseries ! I bow to thee. O Master of this world ! I bow to you. O Lord supreme of the three worlds ! I bow to you. O eradicator of the unending cycle of rebirths ! I bow to you. Ko vismayoatra yadi nama gunairasheshaih tvam samshrito niravakashataya munisha. Doshairupatta vividhashraya jatagarvaih svapnantareapi na kadachidapikshitosi. O Supreme ! It is not surprising that all the virtues have been packed into you, leaving no place for vices. The vices have appeared in other beings. Elated by the false pride, they drift away and do not draw closer to you even in their dream. Uchchairashokatarusamshrita munmayukham abhati rupamamalam bhavato nitantam. Spashtollasat kiranamasta tamo vitanam bimbam raveriva payodhara parshvavarti. O Jina ! Sitting under the Ashoka tree, the aura of your sparkling body gleaming, you look as divinely splendid as the halo of the sun in dense clouds, penetrating the darkness with its rays. Simhasane mani mayukha shikha vichitre vibhrajate tava vapuh kanakavadatam. Bimbam viyadvilasadamshulata vitanam tungodayadri shirasiva sahasrarashmeh. O Jina ! Seated on the throne with kaleidoscopic hue of gems, your splendid golden body looks magnificent and attractive like the rising sun on the peak of the eastern mountain, emitting golden rays under blue sky. Kundavadata chalachamara charushobhama vibharajate tava vapuh kaladhautakantam. udyachchashanaka shuchi nirjhara varidharam uchchaistaam suragireriva shatakaumbham. O Tirthankara ! The snow white fans of loose fibres (giant whisks) swinging on both sides of your golden body appear like streams of water,pure and glittering as the rising moon,flowing down the sides of the peakof the golden mountain,Sumeru. Chhatratrayam tava vibhati shashanka kantam uchchaih sthitam sthagita bhanukara pratapam. Muktaphala prakarajala vivraddhashobham prakhyapayat trijagatah parameshvaratvam O The Greatest One ! A three tier canopy adorns the space over your head. It has the soft white radiance of the moon and is decorated with jewels. This canopy has filtered the scorching sun rays. Indeed, this canopy symbolizes your dominance over the three worlds. Gambhira tara rava purita digvibhagah trailokya loka shubha sangama bhuti dakshah. Saddharmaraja jaya ghoshana ghoshakah san khe dundubhirdhvanati te yashasah pravadi. The vibrant drum beats fill the space in all directions as if awarding your serene presence and calling all the beings of the universe to join the devout path shown by you. All space is resonating with this proclamation of the victory of the true religion. Mandara sundara nameru suparijata santanakadi kusumaotkra vrushti ruddha. Gandhoda bindu shubha manda marutprapata divya divah patati te vachasam tatriva O Jina ! The divine sprinkle of the Mandar Parbat, Sundar,Nameru,Parijata drift towards you with the mild breeze. This alluring scene presents impression as if the devout words spoken by you have changed into flowers and are drifting toward the earthlings. Shumbhat prava valaya bhuri vibha vibhoste lokatraya dyutimatam dyutimakshipanti. Prodyad divakara nirantara bhuri samkhya diptya jayatyapi nishamapi somasaumyam. O Lord ! The resplendent orb around you is more magnificent than any other luminous object in the universe. It quells the darkness of the night and is brighter than many suns put together; yet it is as cool and serene as the bright full moon. Svargapavarga gama marga virmarganeshtah saddharmatatva kathanaika patustrilokyah. Divyadhvanirbhvati te vishadartha sarva bhasha svabhava parinama gunaih prayojyah. Your divine voice is a guide that illuminates the path leading to heaven and liberation; it is fully capable of expounding the essentials of true religion for the benefit of all the beings of the three worlds; it is endowed with miraculous attribute that makes it comprehensible and understood by every listener in his own language. Unnidra hema nava pankaja punjakanti paryullasannakha mayukha shikhabhiramau. Padau padani tava yatra Jinendra dhattah padmani tatra vibudhah parikalpayanti. O Tirthankara ! Your feet are radiant like fresh golden lotuses. Their nails have an attractive glow. Wherever you put your feet the lords create golden lotuses. Ittham yatha tava vibhutirabhujjinendra ! dharmopdeshanavidhau na tatha parasya. Yadrik prabha dinakritah prahatandhakara tadrik kuto grahaganasya vikashinoapi O great one ! The height of grandiloquence, clarity and erudition evident in your words is not seen anywhere else. Indeed,the darkness dispelling glare of the sun can never be seen in the stars and planets. Schyotanmadavilavilolakapolamula mattabhramad bhramara nada vivriddhakopam. Airavatabhamibhamuddhatam apatantam dristva bhayam bhavati no bhavadashritanam. O Tirthanakara! The devotees who have surrendered to you are not scared even of a wild elephant being incessantly annoyed by humming bees. They are always and everywhere fearless as the silence of their deep meditation placates even the most brutal of the beings. Bhinnebha - kumbha - galadujjavala - shonitakta, muktaphala prakara - bhushita bhumibhagah baddhakramah kramagatam harinadhipoapi, nakramati kramayugachalasanshritam te A lion who has torn apart elephant's head with blood flowing under, scattering blood stained pearls on the ground, ready to pounce with growling sound, If your devotee falls in his grasp, and has firm faith in you, even the lion will not touch the devotee. Udbhutabhishanajalodara - bharabhugnah shochyam dashamupagatashchyutajivitashah tvatpadapankaja-rajoamritadigdhadeha, martya bhavanti makaradhvajatulyarupah O the all knowledgeable one ! An extremely sick person, deformed due to dropsy and maladies incurable, having lost all hopes of recovery and survival, when he rubs the nectar-like dust taken from your feet, fully recovers and takes form like cupid sweet. Apada - kanthamurushrrinkhala - veshtitanga, gadham brihannigadakotinighrishtajanghah tvannamamantramanisham manujah smarantah, sadyah svayam vigata-bandhabhaya bhavanti O Liberated one ! Persons thrown in prison, chained from head to toe, whose thighs have been injured by the chain, gets unshackled and freed from enslavement just by chanting your name. Mattadvipendra - mrigaraja - davanalahi sangrama - varidhi - mahodara-bandhanottham tasyashu nashamupayati bhayam bhiyeva, yastavakam stavamimam matimanadhite O Tirhankara ! The one who recites this panegyric with devotion is never afraid of wild elephants, predatory lions, forest inferno, poisonous pythons, tempestuous sea, serious maladies,and slavery. In fact, fear itself is frigthened of him. Stotrastrajam tava jinendra ! gunairnibaddham, bhaktya maya vividhavarnavichitrapushpam dhatte jano ya iha kanthagatamajasram, tam manatungamavasha samupaiti lakshmi O the greatest Lord ! With great devotion, I have made up this string of your virtues. I have decorated it with charming and kaleidoscopic flowers. The devotee who always wears it in the neck (memorises and chants) attracts the goddess Lakshmi. Bhaktamara stotra is widely illustrated in paintings. At the Sanghiji temple at Sanganer, there is a panel illustrating each verse. The verses of Bhaktamar are thought to possess magical properties (tantra). A mystical diagram, yantra, is associated with each verse. "Sadhak Shivaanand Saraswati" (Udayraj Gadnis) has painted a number of yantras associated with Bhaktamar stotra. 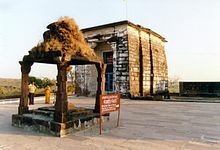 There is a temple at Bharuch with a section dedicated to the Bhaktamar and its author Manatunga. The Bhaktamara Stotra is composed in the meter "Vasantatilka". All the fourteen syllables of this meter are equally divided between short and long syllables i.e. seven laghu and seven gurus and this belongs to sakvari group of meters. It is believed that such an equal division into short and long syllables will help an aspirant attain the state of equanimity quickly, the meter itself serving as a catalyst (mantra). ^ a b Jain 2012, p. xi. ^ "Sumant Shah series of paintings". Greatindianarts.com. Archived from the original on 9 October 2007. This page was last edited on 31 March 2019, at 08:59 (UTC).